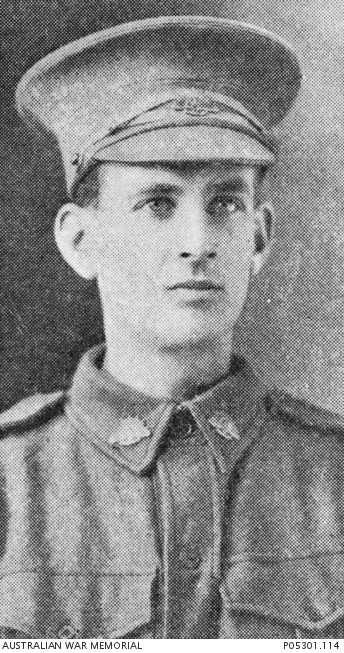 Studio portrait of 180 Private (Pte) William Lionel “Bunt” Stalker, 36th Battalion, of Annandale, New South Wales. A clerk with a year’s service in the Citizens’ Military Forces (CMF) prior to enlistment on 14 December 1915, Pte Stalker embarked on HMAT Beltana (A72) on 13 May 1916. Known as Bunt to his family, Pte Stalker gave this portrait to his sister Ruby before his departure. He was killed in action on 22 January 1917, aged 24 and is buried at Cite Bonjean Military Cemetery, Armentieres.